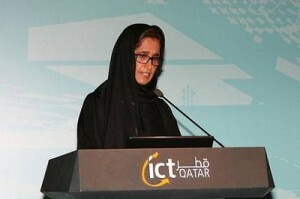 HE Minister of Information and Communications Technology Dr. Hessa Al-Jaber termed the Qatari digital landscape as healthy and vibrant ICT sector due to the existence of legislations that regulate the sector, but stressed on the importance of continuing efforts to modernize development tools in order to meet requirements of digital economy, which its requirements differ from that of typical economy. In remarks before the Qatar’s annual ICT conference and exhibition “QITCOM 2014 on Monday, HE the minister noted that an integrated communication infrastructure had already been set up to satisfy the future needs through national companies such as ES’hailSat, Ooredoo, Qatar National Broadband Network (QNBN) and GBI, Qatar Vodafone and MEEZA, pointing out that local universities graduate a number of students specialized in engineering and technical sciences on an annual basis. The telecom sector witnessed a remarkable growth of 6 per cent in 2008, increasing to 11 per cent in 2013, Her Excellency said, adding that this growth is expected to continue at a rate of 9 or 12 percent in the next five years. “We are moving in the right direction to build the information society and the knowledge-based economy. “We cannot complete the digital landscape in country without mentioning the vast amount of digital data that are now being used on a daily basis by individuals, institutions and companies and our dependence on technological devices.” HE Minister of Information also appreciated the contribution of all local telecom companies in building infrastructure in the State of Qatar over the past few years. HE Minister of Information and Communications Technology Dr. Hessa Al-Jaber urged existing telecom companies to adopt the new business standards to enable them to improve the quality of services provided. HE Dr. Al Jaber also called for more investment in the local market in order to improve the quality of services that serve the actual needs of customers, and also called for working with the “Telecommunications Regulatory Authority ” to create a regulatory environment that serves their interests as companies, boosts the sector and promotes the national economy. On the information technology sector, Her Excellency said, “we are well aware that the number of information technology companies in Qatar today is relatively limited, but the existing companies and those wishing to enter the market should realize that the public and private sectors in Qatar are prosperous and have high aspirations to increase the quality of services, so they have to keep up with the latest global developments in order to meet local needs.” HE the Minister also urged local and international companies in Qatar to take advantage of the cadres that graduate yearly from local universities to train local skills needed for the economy. She also urged companies operating in the telecom sector and information technology to intensify their efforts, and support emerging companies in Qatar, especially in their local contracts. The Minister called on Qatari youths to take the initiative for establishing companies that are able to play a role in developing the digital economy, and exploit Qatar’s current golden era for the sake of establishing companies that can contribute to income sources-diversification on real, feasible scientific and economic basis. With regard to the postal sector, she said, “we cannot talk about the digital economy, e-commerce or upgrading government services without first assuring an advanced mail services, as Qatar’s 2014 digital landscape report indicates that about 88 percent of the population did not use Q-Post Services in the past year, and that the public lack awareness of Q-post services despite the availability of many of these services electronically.” HE Minister of Information said that efforts should be taken to develop regulations for the postal sector in order to provide appropriate services meeting the customers’ needs ranging from individuals to corporates, and also on developing the infrastructure of networks, systems and postal services, as well as developing Qatar Postal Services Company to become a reliable mail operator that is able to compete and be self-sufficient by 2018. Her Excellency also thanked all government agencies that participated in setting the strategies which HE the Prime Minister and Minister of Interior launched today, including the members of the National Committee for e-Government and the National Commission for Information Security which have been formed by His Excellency, lauding their contributions and vital participation in developing these strategies along with the road map for actual implementation. HE Dr. Al Jaber also said that nearly 120 local and global companies and institutions participate in this event which has become an annual regional forum for ICT industry development.